FIGURE 4-16 Vasopressin receptor (V2 receptor) in the kidney. 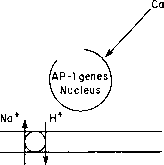 Abbreviations: G„ stimulatory G protein; AC, adenylate cyclase; cAMP, cyclic AMP, PKA, protein kinase A. 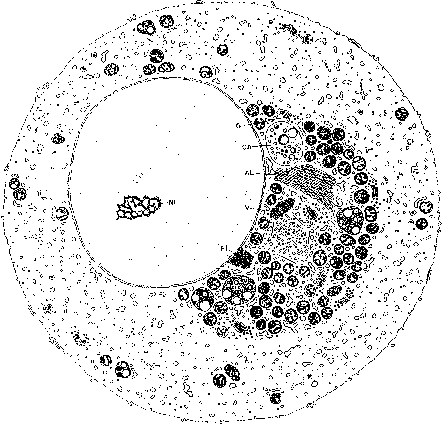 Drawing reproduced from "Hormones" (E.-E. Baulieu and P.A. Kelly, eds. ), p. 288. Chapman and Hall, New York (1990). phenylephrine (see Chapter 11), via an increase in cytoplasmic Ca2+, releases glucose from the liver while promoting the uptake of K+. Release of glucose is accomplished by stimulating the breakdown of glycogen. These actions of VP can be blocked by phentolamine, an a-blocking agent whose structure is shown in Figure 4-17. FIGURE 4-17 Structure of phentolamine, an a-blocking agent. in addition to phosphorylase. Cyclic AMP, a second messenger in ¡6-receptor reactions, is not involved in the effects of VP. VP appears to stimulate the turnover of phosphatidylinositol in hepatocytes, and this effect is linked to either the VP-receptor interaction or the process of extrusion of intracellular Ca2+ and uptake of extracellular Ca2+. A model for the Vj vascular vasopressin receptor action is shown in Figure 4-18. The hepatocyte receptor falls within this general class (see Table 4-1). It has been known for some time that VP injected at a point where it could gain access rapidly to the hypothalamic-pituitary axis could stimulate the release of ACTH, and indeed, VP is a releasing factor for ACTH in addition to the ACTH-releasing action of CRH (see Chapters 3 and 10). The most likely biological role for VP in this context is to function to potentiate the release of ACTH by CRH, although VP can release some ACTH by itself. CRH has been shown to produce rapid stimulation of cyclic AMP in rat anterior pituitary cells. Although VP agonists cause an increase in CRH-induced ACTH release from rat anterior pituitary cells in culture, VP alone has no effect on cyclic AMP levels in these cells. Its action is mediated by the VP Vlb receptor through the Gpk: protein and is similar to the sequence of events in whole or in part shown in Figure 4-18. However, when combined with CRH, VP causes a twofold increase in the CRH-induced accumulation of cyclic AMP; thus, VP acts by enhancing the effectiveness of CRH. Table 4-1 shows a classification of these receptors.